What is it about 3:30 in the morning? Is it me or do others find themselves wide-eyed at the wrong time too? There I was, in someone else’s home, in some else’s bed, in someone else’s suburban neighborhood, outside of someone else’s city… only it was my son’s city now too. We were there for parent weekend; we had been thrilled to come; THRILLED; but after we dropped my son back at the dorms that first night, everything felt wrong. At 3:45 am, I ached for my own bed, in my own home, on my own dirt road, in my own rural community 200 miles away; but in the dark of the night I realized that it had become a stranger too. At 4:00 am, I considered re-arranging my bedroom once home so that my bed was facing south again; but even in my imagination, I knew it wouldn’t be enough. I had lost my familiar. There is something to mothering that steeps one in the familiar, in home, in the timelessness of connection and belonging. As a child myself, I moved more than a dozen times so I never fully experienced this deep hold until my body became my baby’s. Once he was beside me, I no longer relied on the company of my blankie which traveled across the country, and the sea, to be my home. At 4:20 am, I considered the stretch of life ahead of me–without my son–and decided that it might be time to bring my blankie back to bed. I still have my 13 year old at home. Thanks for leading the way! 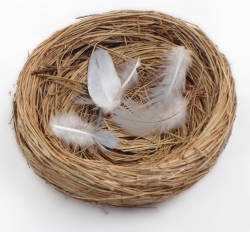 I was just re-reading a favorite old book, “Gift from the Sea” by Anne Morrow Lindbergh & thought of you & this empty nest stage of life you & I are both experiencing. I found these words helpful & comforting. I hope they do the same for you.